For the latest news, see our Facebook page. 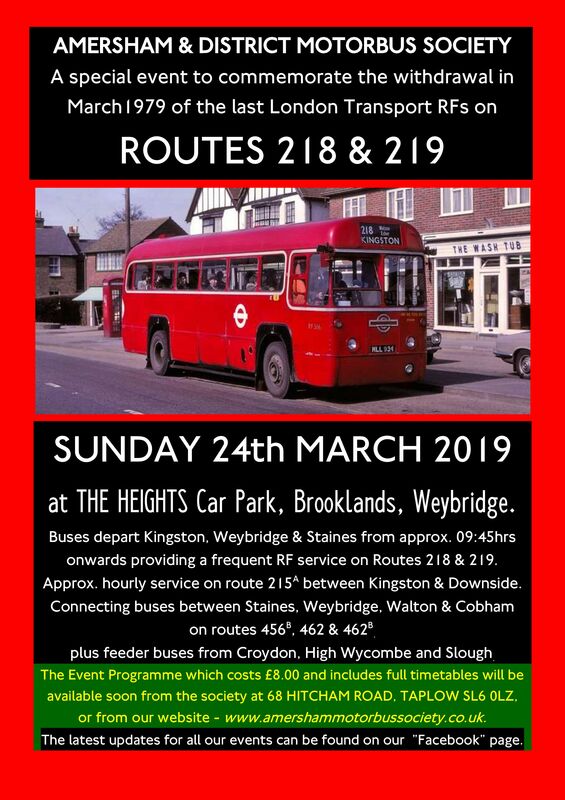 RFs will operate the full length of both routes connecting Kingston, Staines and Weybridge (Brooklands), plus a display of buses in 'The Heights' car park at Brooklands, Weybridge. There will also be a hourly service on 215A between Kingston & Downside, and connecting 'green' buses recreating routes 456B, 462 and 462B, linking Staines, Weybridge, Walton and Cobham. As this running day will cover a wide area, we would recommend that you buy your programme, which will include full bus timetables, in advance. Programmes will be available to order from here in early February. Programmes: £8.00 (inc p&p), order via the programme page, or by post. Also available on the day. ADVANCE ORDER PROGRAMMES WILL BE POSTED ON WEDNESDAY 3RD OCTOBER, BY 1ST CLASS MAIL. 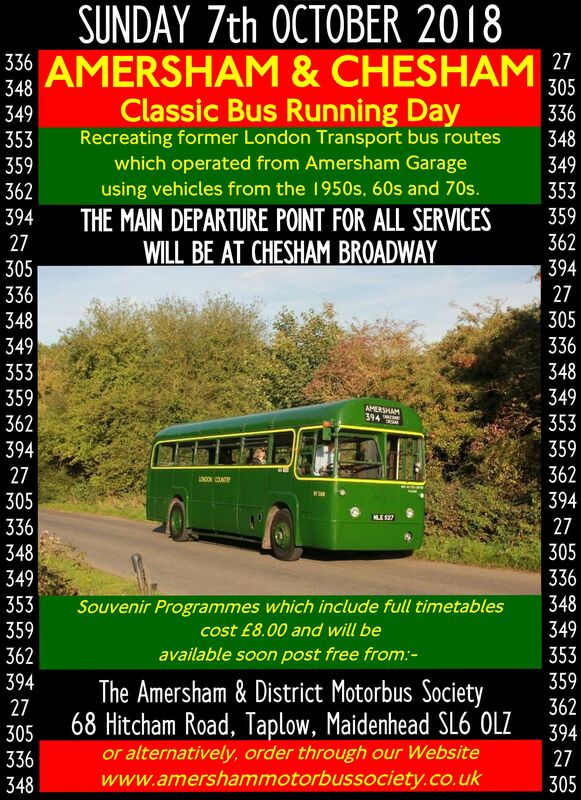 Our traditional autumn running day has moved from Amersham to Chesham this year. Important update; Please note that all buses will now arrive and depart from the bus stops in Chesham Broadway (HP5 1EG). Our gazebo for information and purchase of programmes will be in Chesham Broadway. Chesham Broadway is a very short walk from Chesham Metropolitan Line Station, and there are cafes and toilets nearby. There are also a number of large car parks. A final chance to visit Garston Garage before its final closure. We plan to have a display of former London Transport Country Area buses on part of the garage forecourt, and a frequent classic bus service between Garston Garage and Croxley (Met) Station, from 10.15 onwards. Please note; due to engineering works, there will be NO train service at Watford Junction Station on this day. Programmes: £5.00 (inc p&p), order via the programme page, or by post. Also available on the day. 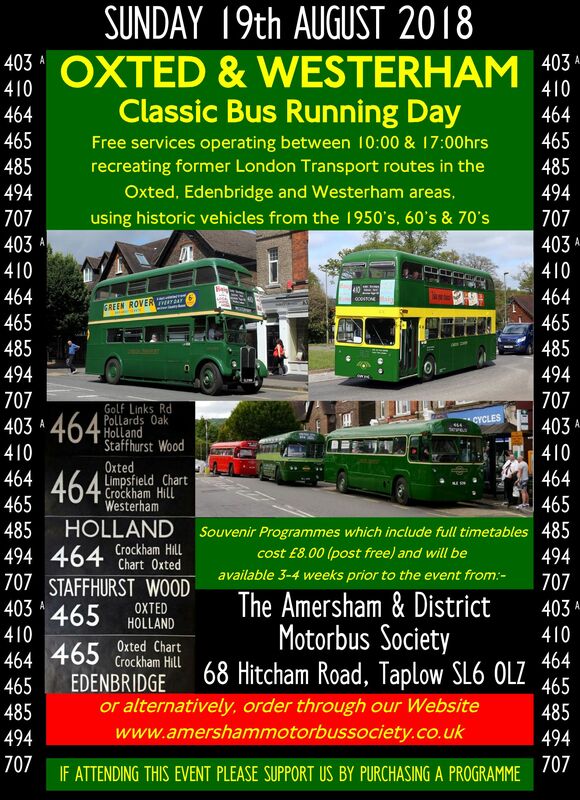 Our 3rd Oxted and Westerham Bus Running Day. This is our favourite running day, it is very relaxed and best captures the atmosphere of Country Area rural services, of the 50s and 60s. So join us for a summer Sunday day out in the best countryside that London's Country can offer. Buses will depart from Station Road East in Oxted, using a selection of RFs and RTs, plus a RLH, XF and a MB. Also we hope to be using a very special green Routemaster! 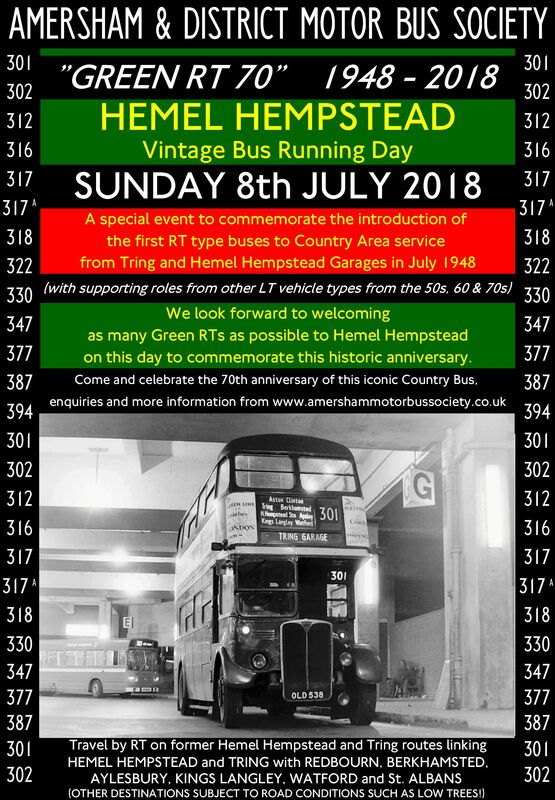 A classic bus running day based in Hemel Hempstead, with an emphasis on green RTs to commemorate the 70th anniversary of their entry into service on route 301. They will be supported by a selection of other classic London buses, including a Routemaster or two! This year, with thanks to Dacorum Borough Council, we are able to bring buses back to the old, and currently disused, bus station in Waterhouse Street. Our first running day for 2018 will be based at Watford Junction bus interchange. As well as recreating various green London Transport routes in and around the Watford area, we will also be running buses to and from Garston Bus Garage from 11.30 onwards. 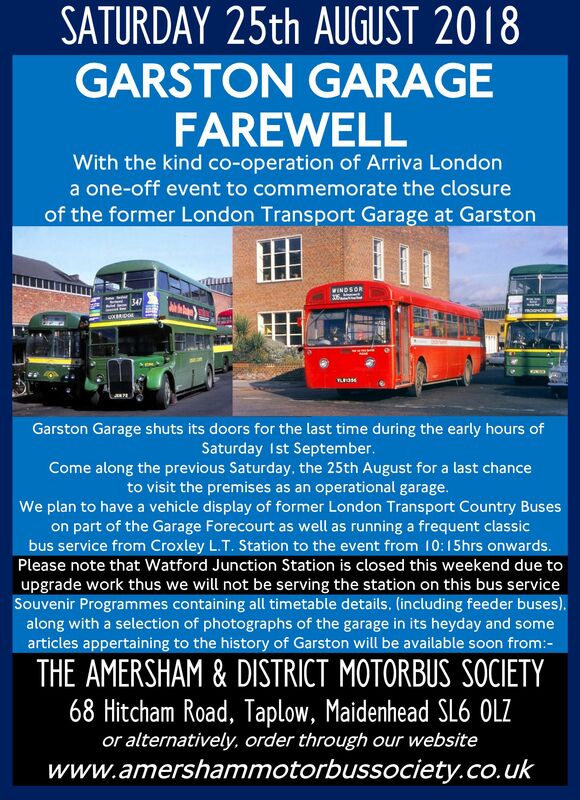 This famous garage is due to close this summer, and Arriva London has allowed us to run arriving buses through the garage with passengers on board! Full timetables of all buses, including feeder journeys, are available in our programme. This is available to order now, and we expect that they will be ready for posting from 18th March onwards. 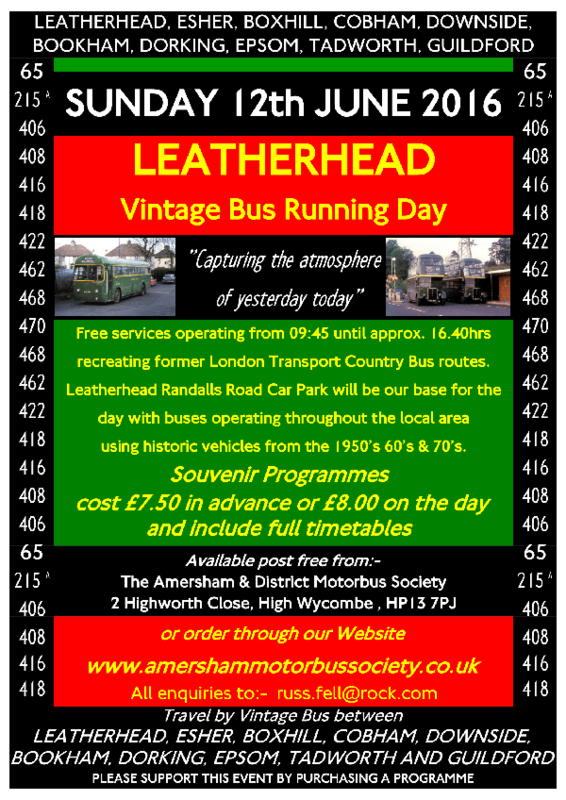 This is our traditional Amersham running day, now in it's 29th year, but with a difference. 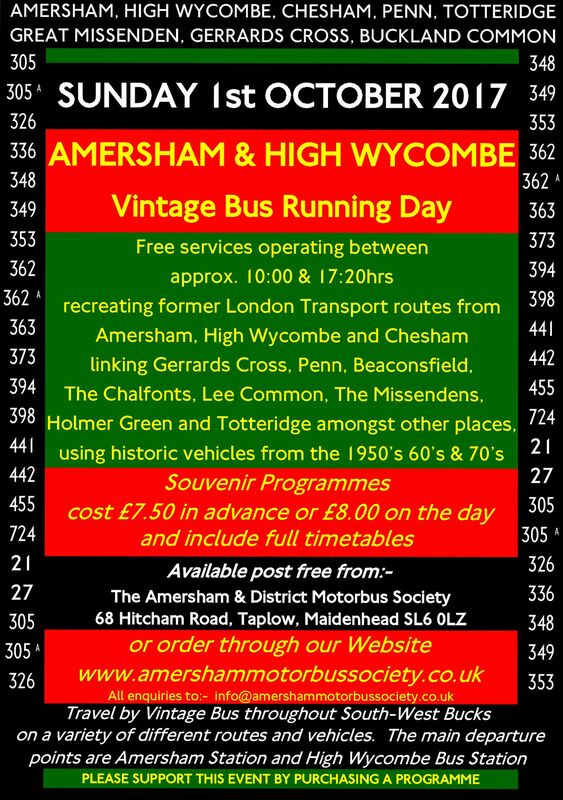 As well as our normal routes around the Amersham area, this year it coincides with the 40th anniversary of the closure of London Country's High Wycombe bus garage, so we will also be recreating some of the High Wycombe local bus routes (and most of them go up hills!). We will be based in the Amersham Station car park, in King George V Road, and in High Wycombe Bus Station. ALL RETURN FEEDER BUS TIMES PLUS FULL DETAILS OF THE DAYS EVENTS ARE CONTAINED IN THE EVENT PROGRAMME. Programmes: £8.00 on the day or £7.50 post free in advance, or ordered online via our programmes page. Our second event based at Leatherhead will take place on Sunday 9th July 2017. Leatherhead's Randalls Road car park will be our base for buses operating on former London Transport routes to Esher, Boxhill, Cobham, Downside, Bookham, Dorking, Epsom, Tadworth and Guildford. 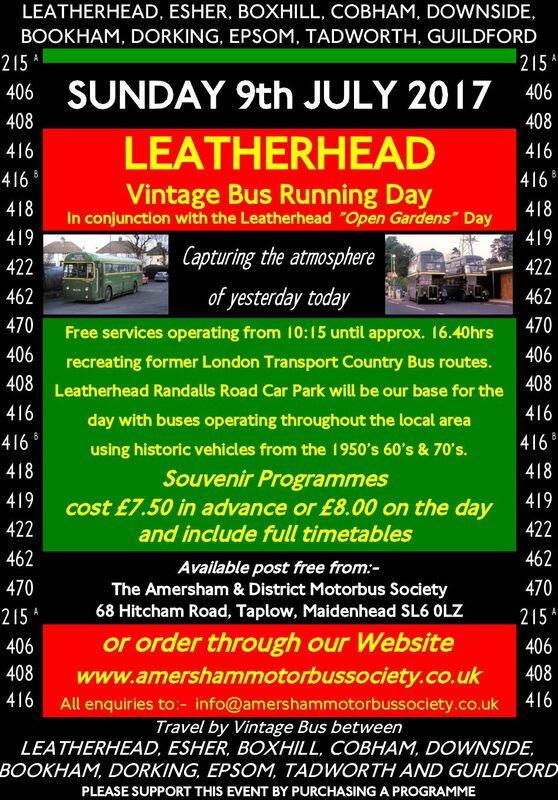 This event is held in conjunction with the Leatherhead "Open Gardens" day, which will be connected by a special vintage bus service. Programmes which include full timetables are available now. Bus 406: From Redhill Bus Station 0930, Reigate Bus Garage 0938, Reigate Red Cross 0940, Reigate Station 0942, Lower Kingswood Fox 0951, Tadworth Station 1000. Bus 408: From Guildford Bus Station 0910, Merrow St. Johns Church 0920, West Clandon Crossroads 0923, East Horsley Duke of Wellington 0929, Effingham Woodlands Road 0934, Great Bookham Rayleigh House 0938. Bus 462: From High Wycombe Bus Station 0800, Wycombe Marsh 0807, Loudwater Turn 0812, Beaconsfield London End 0821. Hedgerley Corner 0829, Slough Station Brunel Way 0845, Datchet Green 0853, Wraysbury George 0901, Staines Bus Station 0910, Chertsey Bell Corner 0925, Addlestone Dukes Head 0931, Weybridge Ship 0939, Weybridge Station 0943, Cobham Between Streets 0953. Bus 470: From Dorking Site of L.T. Garage 0930 & 1100, Dorking Station Stop A 0936 & 1106. Our second event based at Staines will take place on Sunday 21st May 2017. 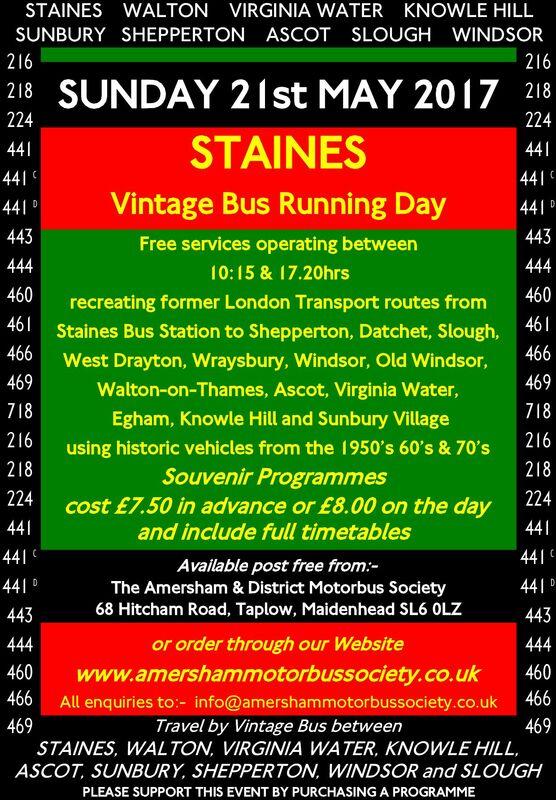 Free vintage bus services will run from Staines Bus Station to Shepperton, Datchet, Slough, West Drayton, Wraysbury, Windsor, Old Windsor, Walton-on-Thames, Ascot, Virginia Water, Egham, Knowle Hill and Sunbury Village. Programmes which include full timetables are now available. Route 216: Kingston Cromwell Road 0915, Hampton Court Green 0923, Hampton Station 0927, Sunbury Village 0935, Sunbury Cross 0940, Ashford Royal Hart 0951. Route 218: Kingston Cromwell Road 0915, Winters Bridge 0926, Esher High Street 0936, Hersham Barley Mow 0943, Walton Ashley Road 0950, Shepperton Station Approach 0959, Laleham Church 1006. Route 441: Slough Station Brunel Way 0942, Windsor Parish Church 0959 then all stops via Old Windsor, Englefield Green, Egham and Pooley Green. Route 725: Croydon Fairfield Halls Stop KC 0840, Wallington Green Stop GW 0851, Sutton Grove Road Stop S 0859, Cheam Village 0903, Worcester Park Station Stop C 0911, New Malden Kingston Road Stop L 0917, Kingston Wood Street Stop P1 0930 then via Hampton Court and Sunbury Cross. A return to Hemel Hempstead on 2nd April 2017. 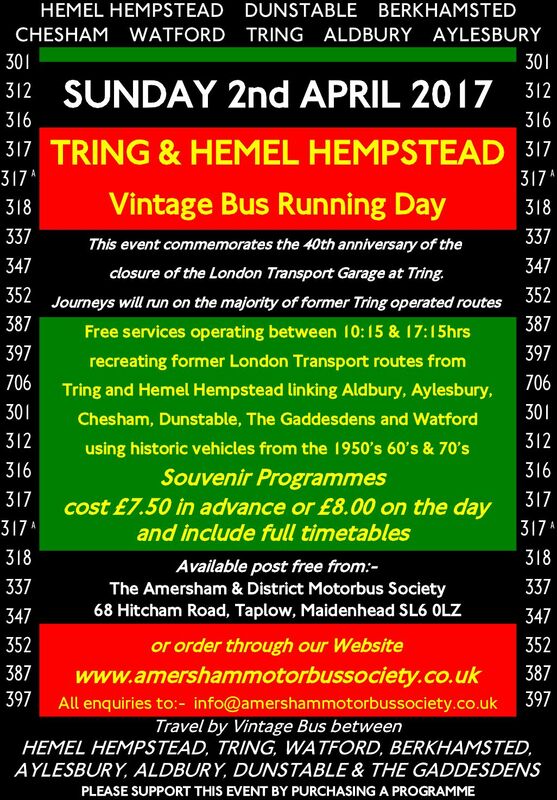 This weekend commemorates the closure of Tring Garage which occurred on Friday 1st April 1977 and as such, this event will feature operations on the routes formally run by Tring as well as the usual selection based on Hemel Hempstead. Free services will link Hemel Hempstead and Tring with Aylesbury, Watford, Aldbury, Chesham, Chipperfield, Berkhamsted, The Gaddesdens, Dagnall, Dunstable and Studham. Hampton Road West [Stop U] 0926, Hanworth Uxbridge Road [Stop AJ] 0928, N.
College] 1024, Kings Langley High Street 1040. 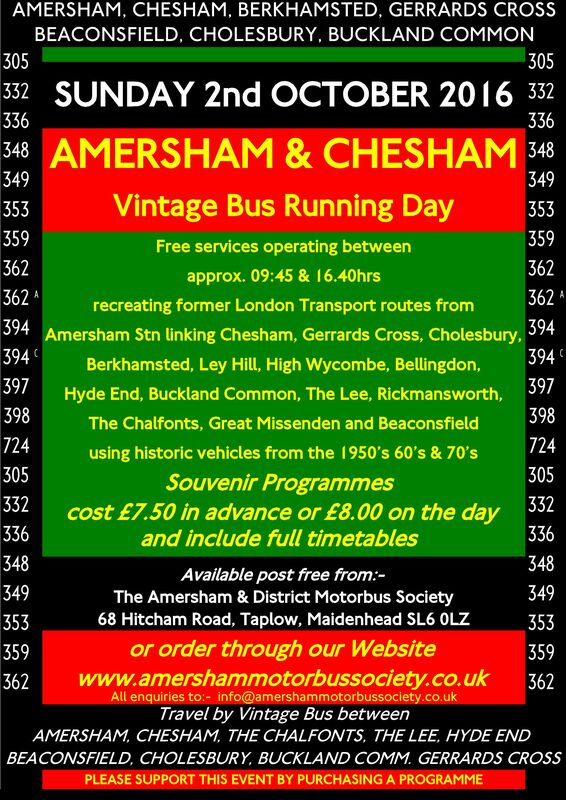 Free services operating between approx 09.45 & 16.40 recreating former London Transport routes from Amersham Station linking Chesham, Gerrards Cross, Cholesbury, Berkhamsted, Ley Hill, High Wycombe, Bellingdon, Hyde End, Buckland Common, The Lee, Rickmansworth, The Chalfonts, Great Missenden and Beaconsfield using historic vehicles from the 1950's, 60's & 70's. Programmes: Sorry, progarmmes are now sold out! 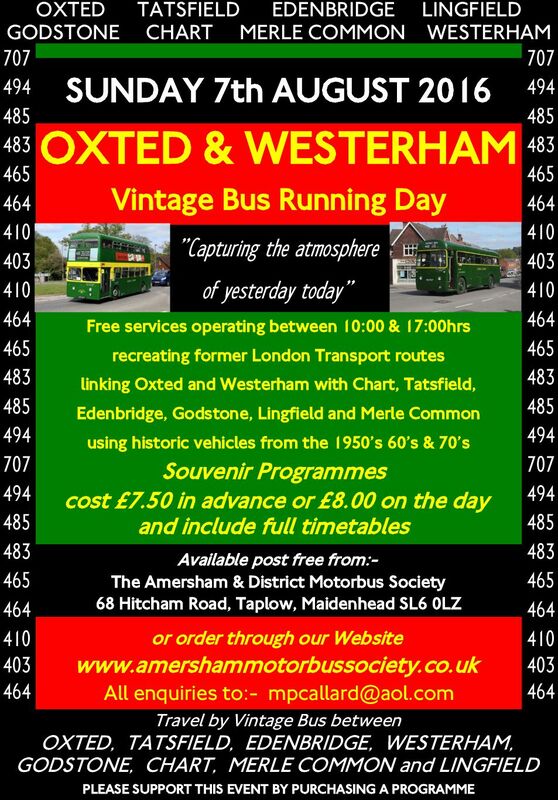 Free services operating between 10.00 and approx 17.00 recreating former London Transport bus routes linking Oxted and Westerham with Chart, Tatsfield, Edenbridge, Godstone, Lingfield and Merle Common using historic vehicles from the 1950's, 60's & 70's. Free services operating between 09.45 and approx. 16.40hrs, recreating former London Transport routes from Leatherhead Randalls Road Car Park using historic vehicles from the 1950s, 60s & 70s. Routes to be operated include 65, 215A, 406, 408, 416, 418, 422, 462, 468 and 470. Programmes: £8.00 on the day or £7.50 post free in advance, or ordered online via our programme page. 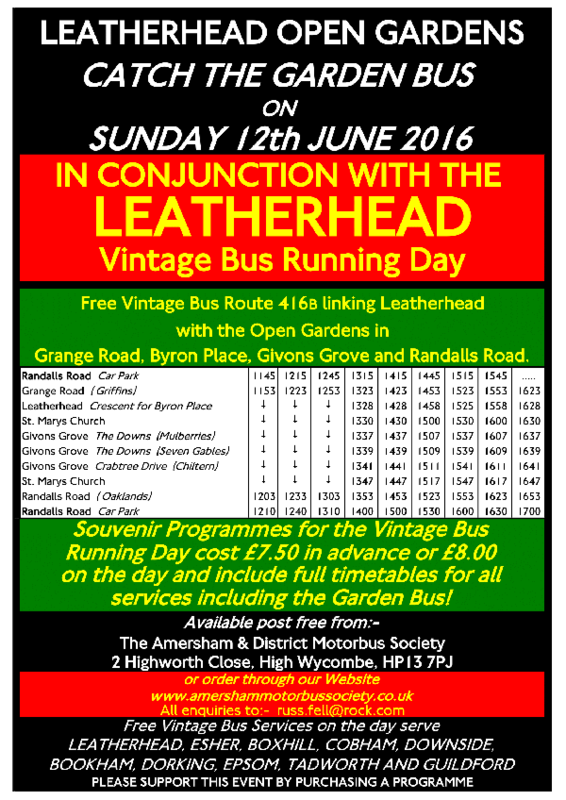 In conjunction with the Leatherhead Open Gardens event and the Leatherhead Vintage Bus Running Day, we are running a free vintage bus service, 416B linking Leatherhead and the Open Gardens in Grange Road, Byron Place, Givons Grove and Randalls Road. 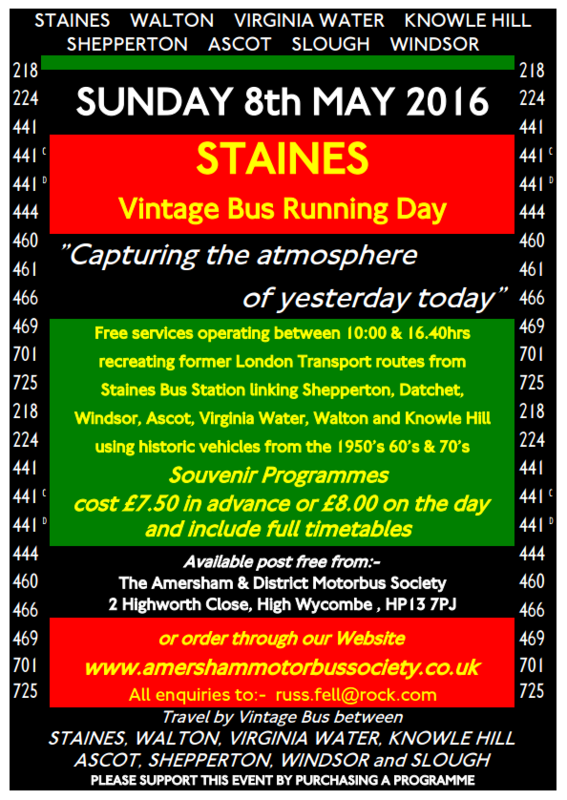 Programmes: For full timetables of all vintage bus services running on this day, including the Garden Bus, £8.00 on the day or £7.50 post free in advance, or ordered online via our programme page. 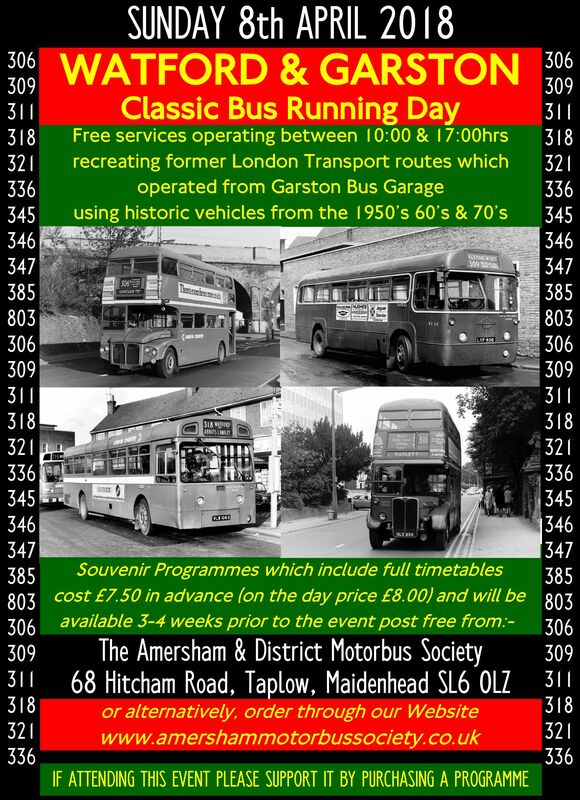 Free services operating between 10:00 and 16:40hrs, recreating former London Transport routes from Staines Bus Station using historic vehicles from the 1950's, 60's & 70's. Routes to be operated include 218, 224, 441/C/D, 444, 460, 461, 466, 469, 701 and 725.